We recommend using either double stick tape or an Avery permanent glue stick to glue the wrappers. SPECIAL NOTE: Hershey® changed their wrappers on the plain chocolate bars (1.55 oz) from a 2-part wrapper with silver foil to a sealed brown wrapper with "crimped ends". On the new Hershey® wrapper, we recommend taping down the ends to the back side of the chocolate bar and wrapping the personalized wrapper around the chocolate bar. Your personalized favor will show brown ends instead of the old silver foil. To glue the personalized wrapper on the chocolate bar, place the wrapper face down on a hard surface. Place the candy bar face down in the center of the wrapper. Pull the side with the copyright label tightly over the candy bar. Add a line of glue (or the double stick tape) on the backside of the statistics side of the wrapper. Pull the wrapper as tight as possible around the candy bar to prevent it from slipping off when handled. Press to seal using clean and DRY hands. Once the wrapper is in place, set the candy bar aside to dry. The sealed brown wrapper should remain on the chocolate bar. Tape the brown crimped ends with clear tape to the back side of the candy bar. Turn the chocolate bar over and place in the center of the silver or gold foil. Fold the long foil ends (top and bottom of bar) towards the center of candy bar. A small piece of tape can be used to hold down the foil in the center of the bar. Crease the short ends at the edge of the chocolate bar and fold in corners (like a present). Fold into the bar. A small piece of tape can be used to hold down the foil. Repeat for both ends. Place the foil wrapped candy bar face down in the center of the personalized wrapper. Pull the side with the copyright label tightly over the candy bar. Add a line of glue (or the double stick tape) on the backside of the statistics side of the wrapper. Pull the wrapper as tight as possible around the candy bar to prevent it from slipping off when handled. Press to seal using clean and dry hands. Once the wrapper is in place, set the candy bar aside to dry. 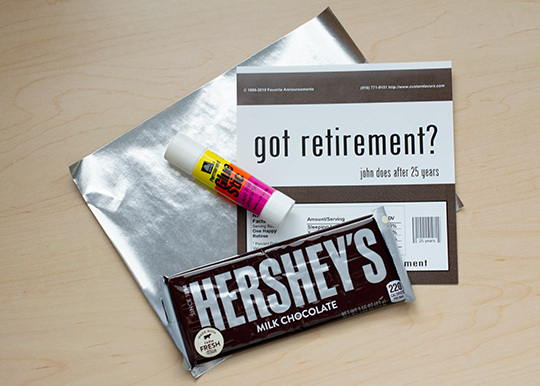 Once dry, enjoy your personalized candy bar wrapper by Favorite Announcements®!!! If you have any questions, do not hesitate to contact us at (916) 771-9151 or email info@customfavors.com ENJOY!! !